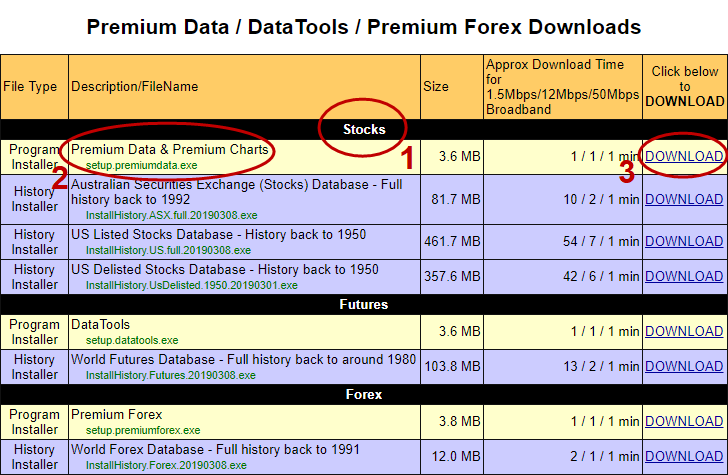 The Downloads area is divided into separate sections for "Stocks", "Futures" and "Forex". However, only those sections that correspond to a current subscription (or free trial) will be visible. Each section contains a program installer (for the relevant updating program) and one or more history installers. For an updating program to work, there must be a corresponding history installed. You will need to download the program installer and the relevant history installer(s) for your data to work. Go to the relevant "Section". Find the row that contains a description of the installer you wish to download. Go across to the right of the row and click on the download link. If prompted to do so by your internet browser, choose a location on your machine where the file will be saved. The illustration below shows the Downloads page with steps to download the Premium Data program installer.